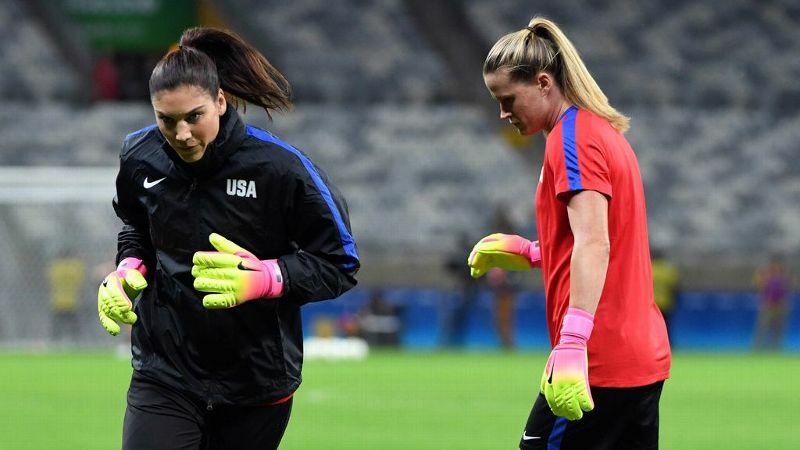 USWNT coach Jill Ellis expresses her excitement about the United States' goalkeeper situation while Hope Solo is suspended. 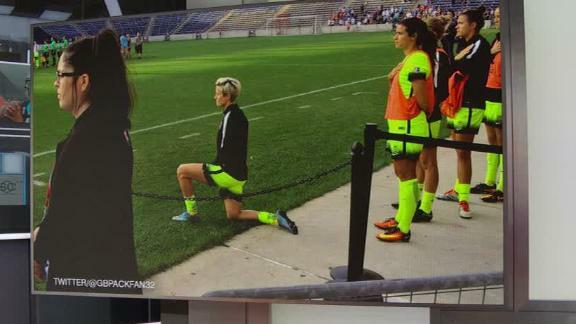 ATLANTA -- Remember back when Hope Solo had the market cornered on controversy? How times have changed. The Netherlands was a goal away this spring from claiming the Olympic berth that Sweden instead nabbed. Under the direction of Pia Sundhage, the Swedes then memorably stifled the United States in an Olympic quarterfinal and eliminated the reigning champions in a shootout. That penalty shootout in Brasilia, in turn, left Solo incapable of stifling her true feelings about Sweden's tactics. Her accusations of cowardice ultimately resulting in a six-month suspension which some feel could mark the permanent conclusion of the goalkeeper's national-team career (despite the "Free Hope" sign fans displayed Sunday night in the Georgia Dome). Which makes one wonder what the past week, not to mention those ahead, would have looked like for the United States women's national team had Sweden's Olivia Schough not scored against the Netherlands in the final minute of the first half of an Olympic qualifier in March. No Sweden in the Olympics, no Solo suspension. So blame Holland. A butterfly flaps its wings and a hurricane happens. Or something like that. There wasn't quite enough time to think through all of those machinations as Dutch winger Shanice van de Sanden bore down on the opposing goal at full speed in the second minute of her team's game against the U.S. on Sunday. But there was time to realize danger was at hand, and then to realize that it wasn't Solo on hand to make one final effort at averting disaster. The Dutch player scored with a shot across goal that any keeper would have struggled to stop. The damage was already done up the field to allow van de Sanden the open run at goal. Less than 120 seconds into the game, the United States trailed. The U.S. eventually erased the deficit for a 3-1 win, a far more useful -- and physical -- game than the 9-0 rout of Thailand four days earlier. 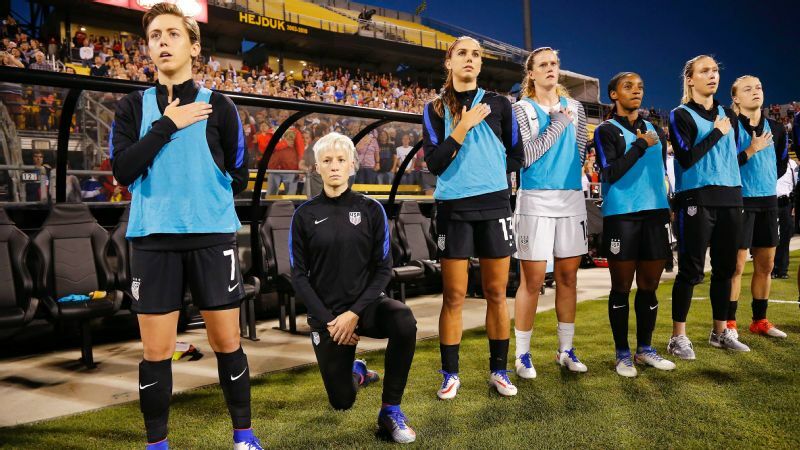 There was the issue of the moment Sunday with Megan Rapinoe again kneeling during the national anthem. 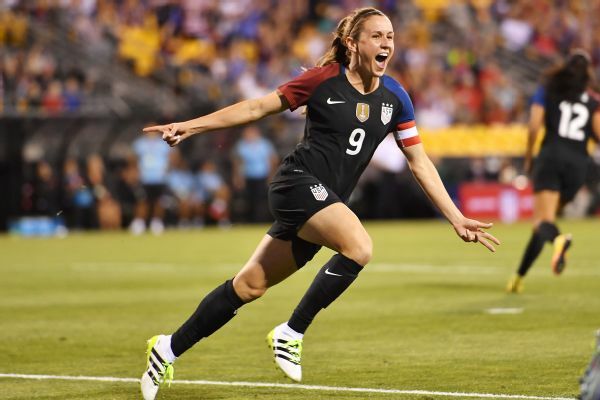 She entered the game to a notably mixed reception in the second half and heard boos every time she touched the ball thereafter -- even after setting up the third goal with a long cross that Carli Lloyd headed back to Allie Long. And there was also plenty of the familiar on display. The best part of the team's abbreviated stay in Brazil was Tobin Heath. She was a scalpel on the right side, lifting the U.S. out of its early doldrums to create the tying goal with a deft cross, which Carli Lloyd finished, and breathing life into the attack. 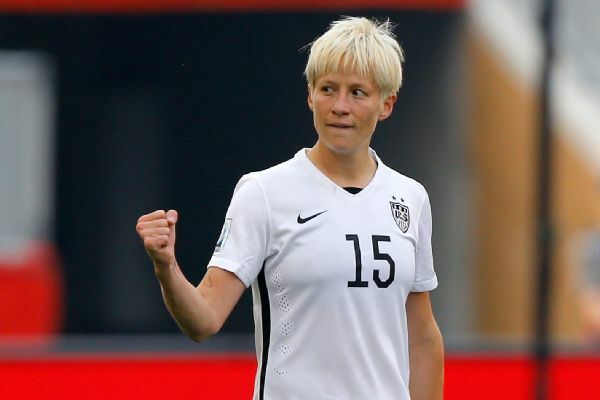 But even as U.S. coach Jill Ellis said that the games against Thailand and Holland were about wrapping up the summer before turning the focus to preparations for a still-distant World Cup, Solo's absence meant the past week was very much about the future for at least one position. For Naeher, who started Sunday, and Ashlyn Harris, who started against Thailand, the time is now. "I think they both had exceptional league seasons and kept their teams in tough games," Ellis said this week. "So it's allowing them now to compete for that No. 1 spot, to go through a process. [It's] also to identify another keeper to bring in -- probably two to bring in to the mix because we want to be planning. That's where we're at with those two. I think by the time end of January rolls around, heading into [the SheBelieves Cup], hopefully by then it will be identifying a starter. "But the great thing about these two is they're so darn competitive, and at times it's very little between them. I think they're going to push each other and make each other better." It's worth reiterating that the opening goal was in no way Naeher's to apologize for, as the U.S. was undone by a quick Dutch counter and a bounce that landed at van de Sanden's feet. In fact, in the rare friendly in which a goalkeeper was kept busy, she was terrific. That included a strong save to protect the two-goal lead late in the second half, but it also came from distribution -- both quick throws and booming kicks -- which drew repeated applause and encouragement from Ellis and assistant coach Tony Gustavsson. Naeher helped spark the U.S. attack into life, too. "I thought tonight, Alyssa gives us a transition game that I love," Ellis said. "Because she picks her head up, and her distribution with her hands and her feet is very good. ... I thought Alyssa had a lot to deal with tonight. I thought she did very well. The one save she got down to was brilliant. "I'm excited. I think they're going to give us a lot of depth, and now when we commit to getting them experience, we're going to have -- I think we already have two world-class keepers -- but two world-class keepers with experience." That is certainly the missing piece. While Naeher, 28, has traveled to two major tournaments, both last year's World Cup and the recent Olympics, Sunday was just her eighth appearance for the national team. The 30-year-old Harris has just one more than that. For more than a decade, minus the occasional absence for injury or suspension, Solo owned the position. It is one sign of how good she is that she kept the best players from the rest of the world at bay for so long. It is another that she kept the best goalkeepers from this country at arm's length, too. Naeher and Harris have been two of the best keepers in NWSL for quite some time, each getting plenty of work in that league's first four seasons. That level of play may be both cause and effect when it comes to their places on the national team. They may have been in the shadows on game days, but those weren't the only days. I think they both had exceptional league seasons and kept their teams in tough games. So it's allowing them now to compete for that No. 1 spot, to go through a process. "I think my time with the team has just helped me get more comfortable in this environment," Naeher said. "It's a faster pace than it is in the professional league. The more you are in with the caliber of players that are here, seeing this pace day in and day out, it kind of demands that you raise your level every day. Being in this environment consistently forces you to keep growing." Naeher said she doesn't feel any greater sense of competition now than in the past, i.e. with Solo around. 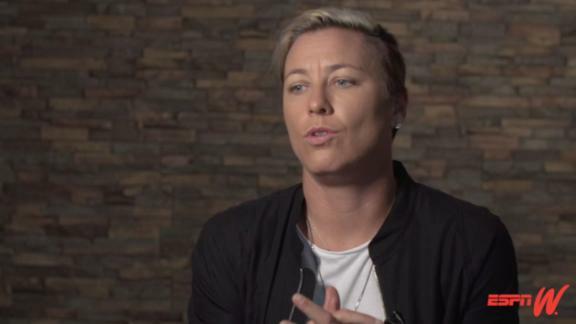 Harris said it is way too early for her to start thinking about France and a World Cup that won't take place for three more years. And there is no guarantee that Solo won't be back. But whatever else occurred in Columbus and Atlanta, it sure felt like the opening rounds of a long-running bout for starts. Not unlike the former starter who used to bristle whenever anyone asked her about the supposedly quiet nights she had when the U.S. dominated possession in front of her, Harris didn't have much patience when asked about her own patience waiting for this opportunity. "You've got to understand that on all my club teams, I've been an impactful player," Harris said "It's hard being on the best team in the world. It's hard to get playing time on this stage. But I have to give myself pats on the back, too, when I'm performing well with my club teams. I've done a lot of great things playing for this country and this national team in the youth stage. Do you have to be patient? Yeah, but it doesn't define my career -- how many caps I've had with this team. I've had a fantastic career. I can sleep at night, and I'm happy with that." How well Ellis, and a lot of U.S. fans, sleep at night will depend on Harris and Naeher.